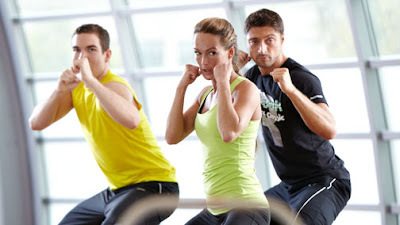 Diabetes Discover's New Sport's: Pure Body Combat | Life, Sport and Diabetes - An everyday look at my life with type 1 diabetes. The next class in my off season trial of new classes was something a bit more adventurous again, pure body combat. Having not really done classes before it was another experience that I'd never had a go at before, and so I didn't know what to expect. But the description of the class was that it was a non- contact class based in the basics of combat and martial arts. In my mind I was thinking this class could be really good for cardiovascular fitness, but also lower and upper body strength which are integral in sprinting. I was hoping that it would be quite power and explosive based, again with similarities to sprinting. Luckily this class- the same as one or two others began with a running warm up. A great way of getting the muscles firing and ready for exercise. It also included side stepping and high knees whilst running to warm up the joints and IT bands. After the warm the class progressed into a very routine based one, by that I mean we would learn different routines and repeat them in a series almost like a dance routine. Similar to leg's bum's and tum's the class involved a lot of squat routine's- both wide legged and leg's together. But not so similar to LBT there were a lot of punches, jab's and kick's in the routine. The kick's were a lot harder to master than the punches that was for sure. But I still really enjoyed learning new movement's. The whole point in the series's of diabetes discover's new classes is to show that having diabetes shouldn't be able to stop you doing anything. I can appreciate that not everyone is into athletics or perhaps even feels that it's for them. But over the year's I've seen just how much of a difference sport can make to your feeling of well-being and also the positive difference it makes to your blood sugars. So with that in mind I think there is a class out there for all abilities. They usually only last an hour at a time and can be for all levels from beginner and beyond. And that small difference of including an hours exercise in your day could be the difference eventually perhaps to reducing your hba1c. If not it would certainly make you feel better and give a great sense of enjoyment.